Salsa continues to grow in popularity. While most people think of salsa as a spicy tomato-based sauce, it also can be made from various fruits. How about some mango or cranberry salsa? Be sure to use research-tested canning recipes such as the ones included in this publication, and follow the formulations exactly. Then you will have a safe, high-quality product to enjoy. *A mixture of mild and hot peppers is recommended. **You can substitute bottled lemon juice for the vinegar. 1. Prepare the peppers. Wear plastic or rubber gloves and do not touch your face while handling or cutting hot peppers. If you do not wear gloves, wash your hands thoroughly with soap and water before touching your face or eyes. Oven or broiler method to blister skins: Place chilies in a hot oven (400 F) or broiler for six to eight minutes until skins blister. To peel after blistering skins, place peppers in a pan and cover with a damp cloth. (This will make peeling the peppers easier.) Cool several minutes; slip off skins. Discard seeds and chop. 2. Combine all ingredients in a large saucepan and heat, stirring frequently, until mixture boils. 3. Reduce heat and simmer for 10 minutes, stirring occasionally. 4. Ladle hot mixture into clean, hot pint jars, leaving ½-inch head space. 5. Remove air bubbles and adjust head space if needed. 6. Wipe rims of jars with a dampened, clean paper towel; apply two-piece metal canning lids. 7. Process in a boiling water-bath canner for 20 minutes (or 25 minutes at altitudes above 6,000 feet). 8. Let cool, undisturbed, 12 to 24 hours and check for seals. 9. Remove ring band and store upright. For best quality, consume within one year. Here’s a tasty way to enjoy your salsa. This recipe is NOT recommended for canning. Store it in your refrigerator for up to a week. Mix ingredients and refrigerate. 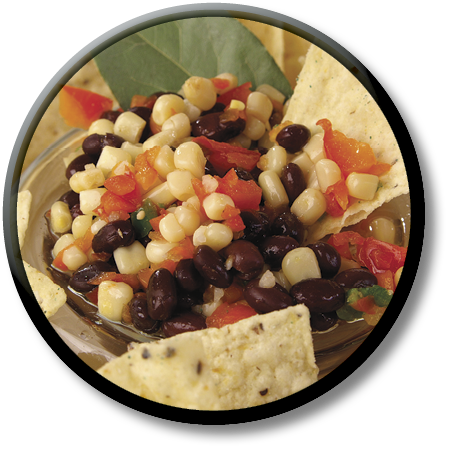 Serve as a dip with tortilla chips. Each serving has 110 calories, 0.5 grams (g) of fat, 21 g of carbohydrate, 6 g of protein and 470 milligrams of sodium. *Caution: Handling green mangoes may irritate some people’s skin in the same way poison ivy does. (They belong to the same plant family.) To avoid this reaction, wear plastic or rubber gloves while working with raw green mangoes. Do not touch your face, lips or eyes after touching or cutting raw green mangoes until all traces are washed away. 1. Wash and rinse half-pint canning jars; keep hot until ready to use. Prepare lids according to manufacturer’s directions. 2. Wash all produce well. Peel and chop into ½-inch cubes. Dice bell pepper into ½-inch pieces. Finely chop yellow onions. 3. Combine all ingredients in an 8-quart Dutch oven or stockpot. Bring to a boil over high heat, stirring to dissolve sugar. Reduce to simmering, and simmer five minutes. 4. Fill hot solids into clean, hot half-pint jars, leaving ½-inch head space. Cover with hot liquid, leaving ½-inch head space. Remove air bubbles and adjust head space if needed. Wipe rims of jars with a dampened, clean paper towel; apply two-piece metal canning lids. 5. Process in a boiling-water canner according to the following recommendations: 10 minutes at 0 to 1,000 feet altitude; 15 minutes at 1,001 to 6,000 feet altitude; 20 minutes at above 6,000 feet altitude. 6. Let cool, undisturbed, for 12 to 24 hours and check for seals. 7. Remove ring band and store upright. For best quality, consume within one year. Source: University of Georgia, Athens for Home Food Preservation. National Center for Home Food Preservation (www.uga.edu/nchfp/) Released by Elizabeth Andress, Ph.D.
Yield: Makes six pint jars. *Caution: Wear plastic or rubber gloves when handling and cutting hot peppers or wash your hands thoroughly with soap and water before touching your face or eyes. 1. Wash and rinse six 1-pint canning jars; keep hot until ready to use. Prepare lids according to manufacturer’s directions. 2. Combine all ingredients except cranberries in a large Dutch oven. Bring to a boil over high heat; reduce heat slightly and boil gently for five minutes. 3. Add cranberries, reduce heat slightly and simmer mixture for 20 minutes, stirring occasionally to prevent scorching. 4. Fill the hot mixture into clean, hot pint jars, leaving ¼-inch head space. Leave saucepot over low heat while filing jars. Remove air bubbles and adjust head space if needed. Wipe rims of jars with a dampened clean paper towel; apply two-piece metal canning lids. 5. Process in a boiling-water canner according to the following recommendations: 10 minutes at 0 to 1,000 feet altitude; 15 minutes at 1,001 to 6,000 feet altitude; or 20 minutes at above 6,000 feet altitude. 6. Let cool, undisturbed, 12 to 24 hours and check for seals.